The badger is approximately 15cm tall. You can make your badger bigger by following this pattern and using a slightly larger needle size. 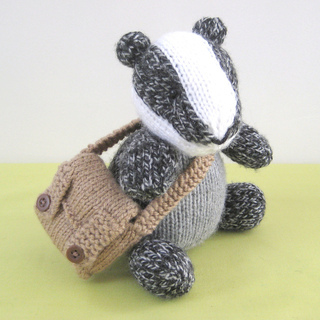 Brompton Badger is going to school with his satchel full of books. 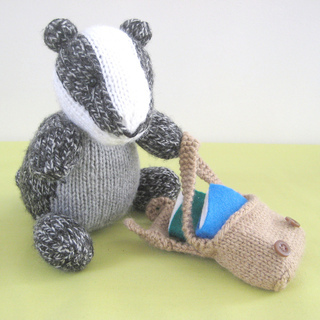 You can make your own clever badger with this knitting pattern. THE PATTERN INCLUDES: Row numbers for each step so you don’t lose your place, instructions for making the badger, satchel and books, photos, a list of abbreviations and explanation of some techniques, a materials list and recommended yarns. The pattern is 6 pages and written in English. TECHNIQUES: All pieces are knitted flat (back and forth) on a pair of straight knitting needles. You will need to cast on and off, knit, purl, work increases and decreases, and sew seams. This pattern incorporates intarsia colour-work to make the badger head and body.